“Without Men” …and Without Reason! Dios mío! Where do I begin? I would like to preface this blog post by saying that I don’t like to bash or badmouth anything I dislike, but this particular film is so tragically wrong, that I find myself forced by the spirits of some of Hollywood’s Latino long-gone legends (Ricardo Montalban, Dolores Del Rio, Katy Jurado, Ricardo Arnaz, and Rita Hayworth) to dissuade you from watching Without Men by director Gabriela Tagliavini. The film is an adaptation of a novel written by James Canon. The premise of the film is as follows according to iMDV: The women of a remote Latin American town are forced to pick up the pieces and remake their world when all the town’s men are forcibly recruited by communist guerrillas. While I’m a huge supporter of all things Latin, I think that Latino film makers in Hollywood with the exception of a very few, namely Robert Rodriguez, Guillermo del Toro and Carlos Saldanha, do Latino films for the sake of doing Latino-themed films… and that my friends, is simply and plainly called pandering to Latinos, which I find as trite and tiring as Lady Gaga pandering to “her” gays, as if she were their savior and only advocate. Why can’t Latino film makers make films with universal themes that appeal to all? With Latino actors, or not… but that are stories that anyone can relate to, without the obligatory and blatant Spanish/Latino pueblo setting, roosters and chickens, thick Spanish accents and brightly colored and exaggerated set designs and costumes? Why can’t we have film makers that will appeal to other aspects of our rich heritage and stop making a caricature of the already tired Latino stereotype in this country? For starters, the film takes place in some fictional town called “Mariquita,” strike one for gay denigration (this word in Spanish is derogatory for gay). Second, all the actors speak English with some ridiculous thick Spanish accent, including Ms. Longoria, when in fact they should be speaking Spanish (that’s what subtitles are for; let the bilingual impaired deal with it). And finally, the writing and the acting leave much to be desired. The story line is ludicrous and the acting, well, let’s just say that some actors should stay in television, and others should really work on their acting skills. The script was mediocre at best and plain out ridiculous at worse. The ONLY good thing that happened in that movie, was the moment in which there’s an apparition, and I don’t mean of a celestial body, but of the devil herself masterfully manifested in Kate Del Castillo, the ONLY reason I would have suffered through this experience, had the film not pixellated twice (it was filmed in digital format) before I walked out of it. Talk about personifying a character… she actually looked butcher than me and she was supposed to, she was the devil incarnated in her heavenly and womanly self! Now, that’s what I call acting. 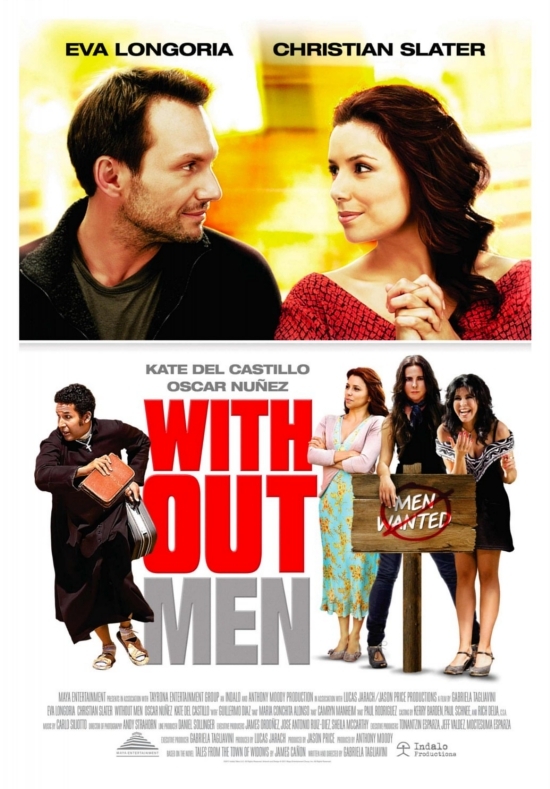 The film had an interesting cast, composed of, shall we say, Retro B-stars such as Paul Rodriguez and Maria Conchita Alonso, to A-Listers such as Kate del Castillo herself, Eva Longoria, Christian Slater, Cameron Manheim, and The Office’s Oscar Nuñez. I was expecting to see Sofia Vergara, Jimmy Smits, Edward James Olmos, Rita Moreno, Benjamin Bratt, Elizabeth Peña and Esai Morales jump out of the screen as well, since the film practically was oozing “Latinoness” from every angle possible. Why Eva Longoria would do this film? well, desperate times call for desperate measures I suppose, but Kate del Castillo? Honey, you’re coming off a tidal Tsunami wave with La Reina del Sur, I’m sure this was your community service for the year and I commend you for it, but quite frankly, you don’t need it, not after your Reina del Sur mega hit, and your previous work in Hollywood, e.g. Under the Same Moon, Julia, Trade, and Weeds! Don’t do it again…you’re much better than that, and you know it. I think Latinos in Hollywood need to watch more film makers south of the border to see the universal themes being captured, without the unnecessary use of Latino themes per se… I don’t wear zarapes or “espeak wiss an ascent,” come on guys, it’s a de-service to all Latinos. We know who we are, and we don’t need to be constantly reminded of the burros and roosters, and the Latino parody that is already perpetuated by mainstream Hollywood. Give us stories of real Latinos: struggling college students, high-powered attorneys, politicians, surgeons, scientists, and corporate leaders with human interest stories, but above all, give us great story telling, like the great directors of Mexico’s Golden Age of Cinema. Learn from the past and apply it to the complex American Latino of the present… make it believable. Until then, we will continue to be just that, a caricature, an ongoing joke of what “Mainstream America” thinks Latinos all look like. Ya basta! We don’t need it from Latino film makers. That looks horrible!! I’ve got to say, however, that as bad as it may have been it’s your duty to stay through to the end if you plan on writing a review of the movie. I know the chances are a million to one, but there might be at least a few redeeming qualities worth mentioning elsewhere in this disaster. I’ve only ever seen Kate Del Castillo in one other film, the almost equally horrendous and downright sugary “Bajo La Misma Luna.” Now that was schmaltz! When Hollywood tries to make films directed at the Latino market they fail miserably. Yes Samn. I think we need more Gregory Navas… the Latin Scorcesse’s of the world if you will.